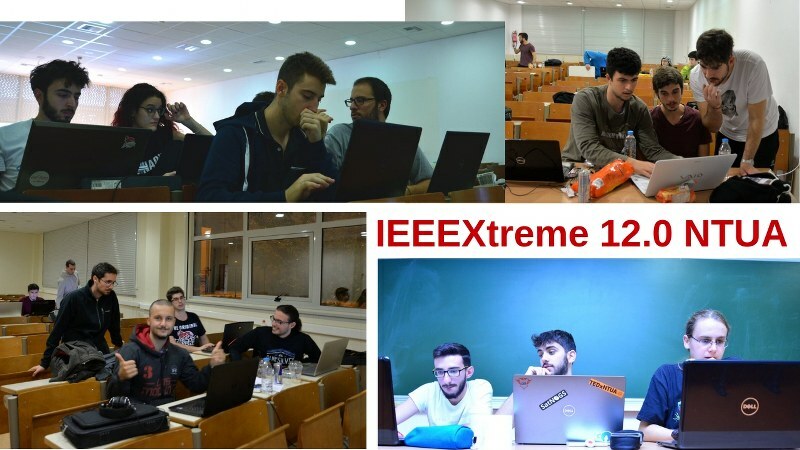 The School of Electrical and Computer Engineering of the NTUA in cooperation with the IEEE NTUA, UoP and UoWA Student Branches hosted the IEEEXtreme 12.0 competition, between October 20-21, 2018. Forty-eight teams from four Greek Universities participated in the competition hosted at our campus. About four thousand teams participated from all over the world in the IEEEXtreme 12.0 competition. Five ECE-NTUA teams are among the top worldwide. The WinFirstSearch team is ranked 23rd out of 4049 teams, the CoffeeTransistors team 98th, the EnOreonPiasto team 188th, the AoiTRIPLOI team 210th and the Pythons 226th place. IEEEXtreme is a global challenge in which teams of IEEE Student members compete in a 24-hour time span against each other to solve a set of programming problems that can be answered in any of the supported languages (C, C++, C#, Java, Python, Ruby, Perl, and PHP). The competition includes questions from various difficulties, from novice to expert levels. All teams receive the same problems and are expected to solve them without outside consultation. Points are awarded based on how the problem was solved and the time it took.